There's a lot to be said for drifting on a lake aboard a giant plastic swan and London's parks and boating lakes are the perfect place for messing about on the water. We've rounded up London's rowing and pedalo options by area, but if you spot one that we've missed, let us know in the comments below. Opening times and prices are accurate at time of writing, but it's worth checking with the individual companies before you go, especially if the weather's a bit iffy, as they sometimes close early on rainy days. Ally Pally Boating Lake has rowing boats and pedalos available to hire by the hour or half hour. 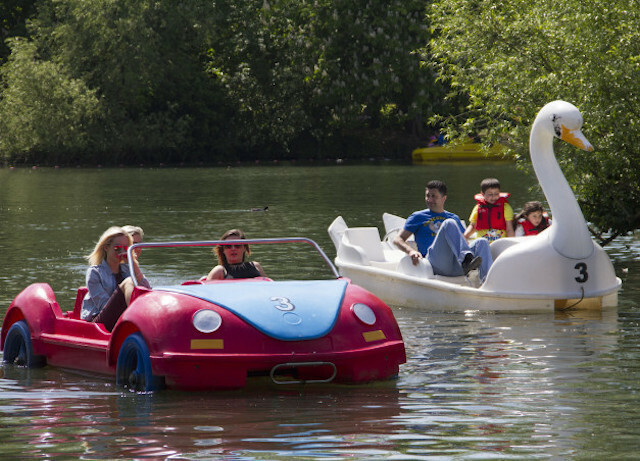 If you go for a pedalo, there's a choice of the classic swan, dragons, or a VW Beetle car. When? Open all year, 10am-4pm October-March; 1oam-6pm April-September. Nearby: The Lakeside Cafe is right next to the boating lake (open April to November), or see what else is going on in and around Alexandra Palace (including ice skating and mini golf) — although we reckon it's worth a trip for the view alone. Finsbury Park Boats offer rowing boat hire on the lake, in a wildlife area of the park. Swan and duck feed is available to buy, so you can splash out on the feathered residents as you ride. When? Everyday, Easter to October, 12pm-6pm. Prices: £8 per boat for 30 minutes (maximum four people per boat) note: minimum £9 for card payments. Euros also accepted. Nearby: Finsbury Park Cafe is a short walk away and is open all year round. 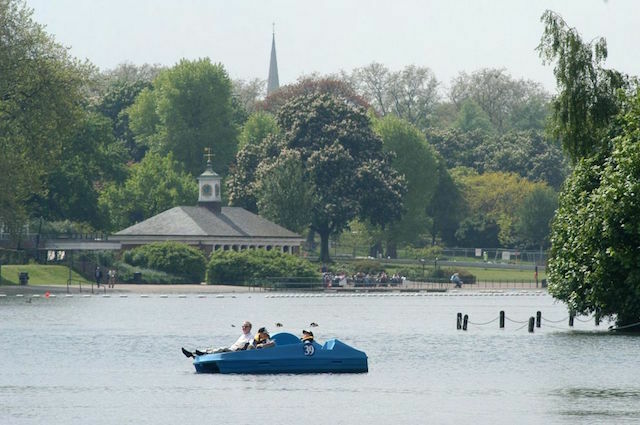 Take to the water in a pedalo in the largest park in the borough of Bromley, in the shadow of the famous Victorian dinosaurs. When? Weekends, school holidays and bank holidays from Easter-October, 10am-5pm. Prices: Adult £4 | child £2 | family £10. No credit cards. Nearby: A children's playground, a national sports centre, a maze and cafe. Both pedalos and row boats are for hire in Dulwich Park, with each boat holding up to five people. When? Weekends, school holidays and bank holidays from Easter until October, 10am-5pm. Nearby: There's a cafe close to the boating lake in Dulwich Park. Horniman Museum is a 25-minute walk away. There's a fleet of row boats and pedalos to hire, courtesy of Park Boats London (the same company responsible for Dulwich and Crytsal Palace, above) — each boat holds up to five people. Nearby: Situated right in the centre of Greenwich, near The National Maritime Museum, Old Royal Naval College, Cutty Sark and more. 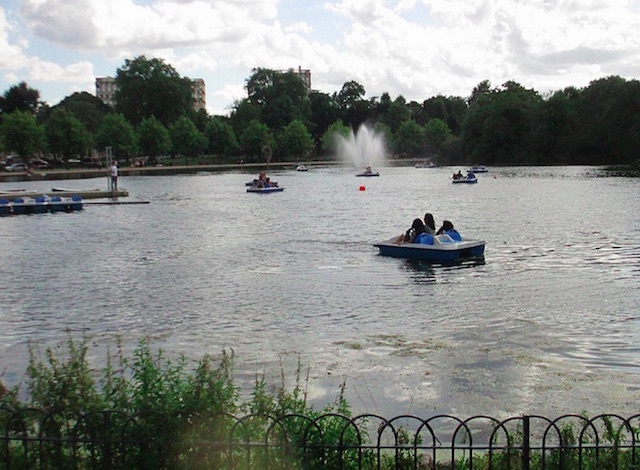 Regal Boat Hire is responsible for the boating facilities in Victoria Park. The fleet of 40 boats includes row boats and pedalos. When? Currently open Tuesday-Friday 11am-4pm, Saturday-Sunday 11am-5pm. Open every day during the summer. Until 31 October. Prices: £10 per boat for 30 minutes. Nearby: The Pavilion Park Cafe is near the lake. There are plenty of options for taking to the Thames in Richmond, from row boats to hire, to cruises down to Hampton Court and beyond. See your choices here. The Serpentine in Hyde Park is probably London's most famous boating lake. The row and pedal boats hold up to six people each, while the lake is also home to the UK's first Solarshuttle, a boat holding up to 40 people which moves quietly across the lake, powered only by the sun. When? Daily April-October, 1oam-sundown (Solarshuttle: weekends, school and public holidays March-end September, full time June-August, noon-sundown). Prices: Adult £12 per hour/£10 per 30 minutes | child (under 15) £5 per hour/£4 per 30 minutes. Nearby: Places to eat and drink include Serpentine Bar and Kitchen and Lido Cafe Bar. There are also toilets nearby. Regent's Park has a large boating lake and a smaller one just for children. The large one offers both rowing boats and pedalos, while the children's lake has child-sized pedalos, perfect for wearing them out during the school holidays. When? Daily, April-October, 10am-6pm (children's lake: weekends, bank holidays and school holidays). Prices: Adults £5.50-£9 | child £4 (20 minutes). £5 deposit for all boats. Nearby: Regent's Park is also home to toilets, a handful of cafes, the Open Air Theatre and London Zoo. Also nearby is the Sherlock Holmes Museum and Madame Tussauds, and plenty of restaurants on Baker Street. On the south side of Battersea Park, adjacent to the ladies pond, lies the boating lake, where row and pedal boats can be hired. When? July-August, September weekends depending on weather. Prices: Adults £5 half hour/£7 hour | child £3 half hour/£4 hour | family £13 half hour/£18 hour. Nearby: Various cafes and toilets in the park, and Battersea Park Zoo.